The Adventure Gamer: Game 11: Maniac Mansion - Won! Phew! 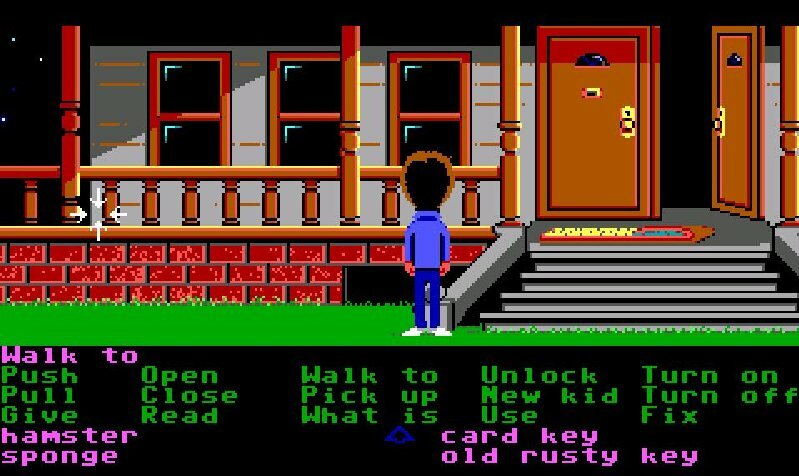 Maniac Mansion was a pretty tough nut to crack (it took me seven hours all up)! Even though I had a fair idea of how events were going to play out towards the end, there were a couple of times where I was well and truly stuck. As you may have gathered from my last post (well you would have if you’ve played the game yourself), I was totally barking up the wrong tree when it came to getting hold of some radioactive material to use on the man-eating plant. 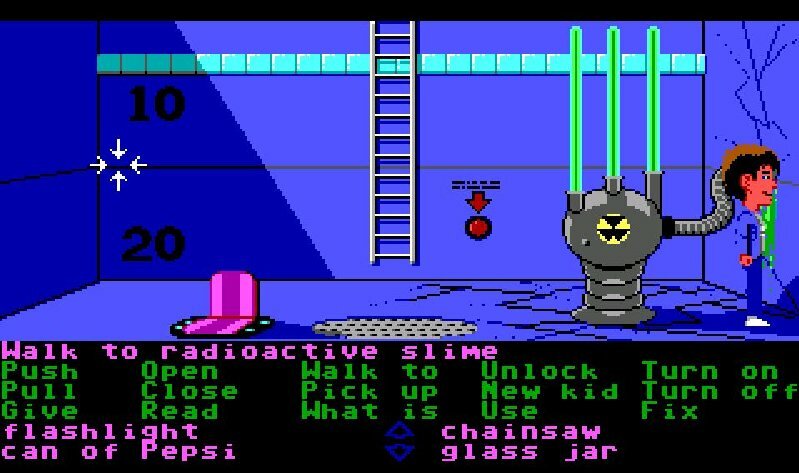 I spent a long time trying to collect the radioactive goo on the floor in the reactor room with various utensils before finally resolving to look elsewhere when that failed. Not long afterwards I remembered seeing radioactive rods in the emptied pool, so I emptied it once again and climbed in to see if I could find any material in there that I’d missed the first time around. When that failed too, I was seriously about thirty seconds away from posting a request for assistance, when out of nowhere I had one of those eureka moments I spoke about recently (although this one could easily be labelled a face-palm). Of course the water in the pool would be contaminated by the rods that were cooling in it! I collected some of the water and used it on the plant which increased in size as expected. However, as soon as I thought I’d set the last phase of the game in motion, I found myself totally stuck once again. Not how you do it! This time it was the telescope that gave me so much trouble. As soon as I saw it I knew its purpose was to read the tiny scrawled message on the wall in Edna’s storage room, but after entering my dime into the control panel and turning it either left or right, I simply couldn’t see anything useful through it. It soon became apparent that I was going to need more dimes to turn it further, but I didn’t have the slightest clue where to find them. I thought I’d searched every single room in the mansion as well as I could, so I was a bit perplexed to find that I’d missed something somewhere along the way. I decided to spend some time focussing on the items in my inventory that had served no purpose to date (in particular the package, manuscript and stamps). The advertisement that constantly plays on the TV shows a publisher that claims they will publish any story sent to a particular address. I couldn’t see any reason why I should try to get the manuscript published, but since the only thing I’d used Wendy’s skills for since the beginning of the game was to edit the manuscript on the typewriter, I figured it must be for something. The stamps wouldn’t stick on the manuscript itself, so it seemed logical that I needed to find something to put the manuscript in to send it to the publishers. This led me to focus on the package I’d intercepted on delivery to Ed, which inadvertently led me to the dimes I needed. There are a few novels I've read that may have passed through 222 Skyscraper Way at some point. Any attempts to open the package received a message stating that it would be illegal to do so. Getting desperate, I got the boneheaded idea that if I could actually deliver the package to Ed now that I’d removed the stamps from it, I could then somehow recover the empty box and in turn use that to send the manuscript to the publisher. Thinking about it now, that doesn’t make sense at all, as why would you take the stamps off the box and then put them back on to send an item later, but as I said, I was getting desperate. I decided to go outside and knock on the door and try to give him the package to see what would happen. Needless to say, he didn’t accept it and told me to get lost, but when the view temporarily switched to his room, I noticed the piggy bank sitting there on the drawer, undoubtedly containing the dimes I needed to move the telescope. I’d been in his room earlier and stolen the hamster and card key, but since my attempts to pick up the piggy bank at the time failed, I’d simply moved on and forgotten about it. Now that I needed coins though, I could think of nothing else! I rang the doorbell again and while Ed was coming down to the door, I sent Bernard into the room to try to do something with the piggy bank. It turns out that selecting the verb “open” and then clicking the pig causes Bernard to break it, therefore gaining access to the dimes. 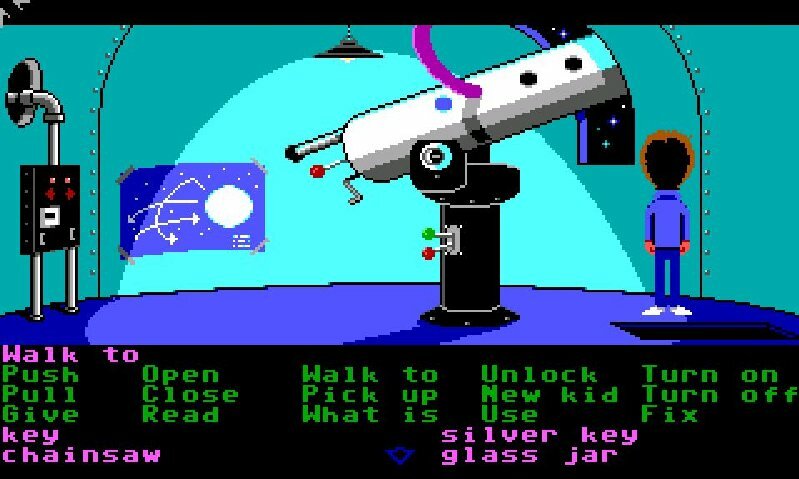 Using the dimes in the telescope did exactly what I thought it would and I soon had the code I needed to get through the inner cell door and into the secret lab! The old rusty key opens the old rusty grate. Pretty obvious right? Right??!! …the rusty key didn’t actually open the rusty grate. After looking up a walkthrough (once I’d completed the game) to see where I’d gone wrong with the rusty key, it turns out that making my characters lift weights made them stronger, which allowed them to open the grate when they couldn’t previously. When I initially selected “open” and then clicked on the grate, the game told me I couldn’t budge it. When I later selected “unlock” and then clicked on the rusty grate, and then selected the rusty key in my inventory (forming the sentence “unlock rusty grate with rusty key”), the grate opened. I don’t think I can be blamed for thinking that it was the rusty key that opened it and not my newly buffed physique, and therefore, given the fact no other key is used for multiple purposes, I don’t think I can be blamed for not ever trying to use the rusty key on any other lock in the game. At least I didn’t until I decided to try every key I had on every lock I hadn’t unlocked, just to make sure one of them didn't just happen to serve multiple purposes. When I tried the rusty key on the locked door in the reactor room, it opened, and I soon found myself in the dungeon cell, with my palm firmly placed on my face. This confusion could easily have been avoided by either a) not allowing me to open the grate by using the key, as that actually had nothing to do with it or b) making it more obvious that my initial failure to open the grate was due to me not being strong enough (a “perhaps if you worked out a bit” style message wouldn’t have gone astray). The same can be said for the garage door incident described in the last post, which was also a result of a “working out” based puzzle not given enough clarity. That's ok Dr Fred. I didn't have anything better to do today anyway. Let's be friends! Gripe aside, Maniac Mansion was a thoroughly enjoyable and impressively pioneering adventure game that will unquestionably do pretty well when I apply a PISSED rating to it in the next day or so. Its interface, graphics, multiple characters, branching pathways and use of cut scenes were all revolutionary and yet somehow it didn’t collapse under its own weight. 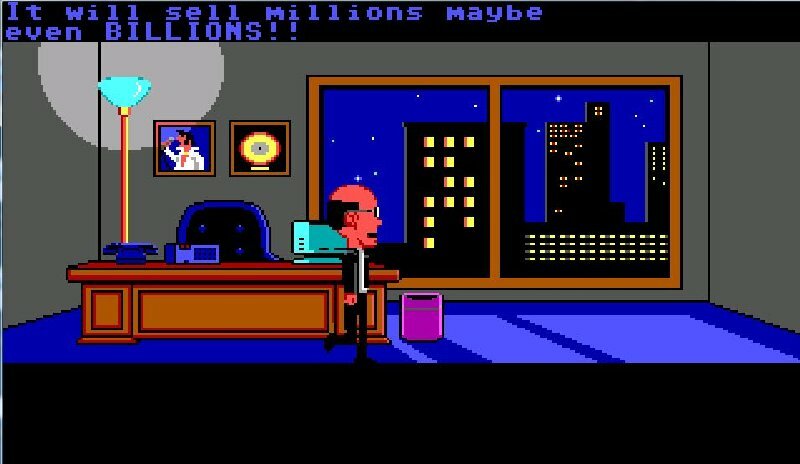 Obviously I’m not really in a position to be able to play through it again with different characters (I’m sure you’d all rather me move onto the next game instead of banging on about this one ad infinitum), but the fact that I want to is testament to both how enjoyable Maniac Mansion is and how replayable it is. I’m certain I haven’t used Wendy to the best of her abilities, as her skills never really came into play. 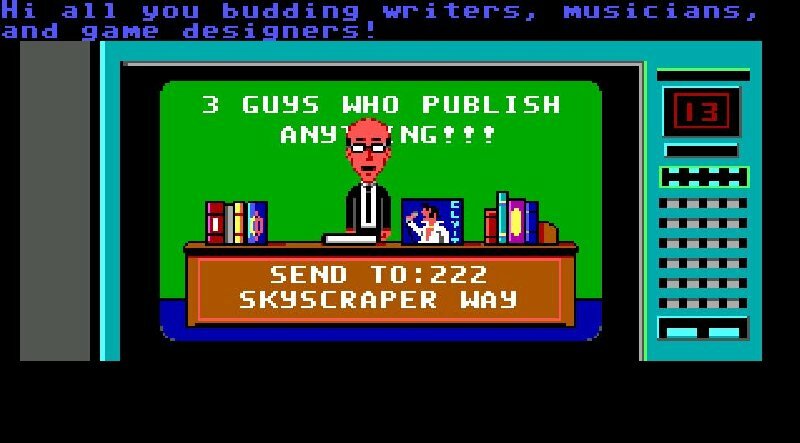 I did end up sending the manuscript off and witnessed a cut scene of the publisher wanting to offer the meteor a million dollars for the rights, but I finished the game before anything further could play out on that front. I can only imagine that this might have led to another game winning solution, unless it somehow led to the one I experienced in some abstract way. I’ll have a look through some more walkthroughs before my Final Rating post, but from what I can tell, you can finish the game with only two characters, which is pretty much what I did, albeit unintentionally. Way to go! Nice work on this one! I certainly don't remember it as an easy game, and it was, as usual, a pleasure to follow your adventures. About the book ending, I'm not sure, but I think it featured the purple meteor in a talk show of some kind. I can't remember a lot of it, except that it was pretty funny. Congratulations for solving the classic! It's been a pleasure reading the experiences of a first-time Maniac Mansioner. Here's the complete story of the "Wendy-ending". 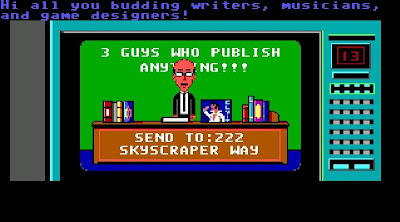 The publisher sends you a lucrative contract. When you give the contract to the meteor, he realizes he doesn't have to be evil anymore and instead becomes a famous writer. The game ends with the meteor in a talk show. If you have called the meteor police, he will barge in the talk show and arrest the meteor, although meteor has reformed. Wow! I finally got a chance to check a bit of the show out. Not at all what I was expecting and the tone is entirely different to the game. The multiple endings really do add to the charm of this game. I think the initial pick of Bernard and Wendy were to give you the best options for finishing the game. There is a way to give the package to Ed, although I think it's as simple as just placing it in front of the door. Good job sticking with it! I'm glad you were able to get to the end. Excellent: I think I really got a feel for that game. Kudos to you! Now that you're finished, you can get an idea of how the game is solved using different kids with this descriptive item list. Also, in case you have a mischievous sense of humor like I do, how to get killed in the game. (You couldn't microwave the hamster only because you were using the wrong kid; only Syd & Razor will do it.) They used the NES version, but from what I can tell, it mirrored the DOS one well enough. You can skip ahead to "The Untold Story."